Cloud2TV is based on the concept of virtual channel playout and is totally software-centric - the future of video production and content delivery, providing TV operators with ultimate simplicity, efficiency and agility. Beyond virtual appliances, the broadcast industry requires a cloud-native solution to ensure its response to technical and commercial challenges are fully up to date. Building on nearly 20 years of successful innovation, PlayBox Neo pioneered the development of high-efficiency server-based and cloud-based playout to support every scale and type of one-to-many communication. With over 18,000 installed channels around the world, PlayBox Neo is the global leader in developing and supplying server-based playout and channel branding systems, many of which are remotely controlled via the Internet. Cloud2TV provides broadcasters with a secure and efficient system through which to access their playout from practically any location via one easy to-use interface. 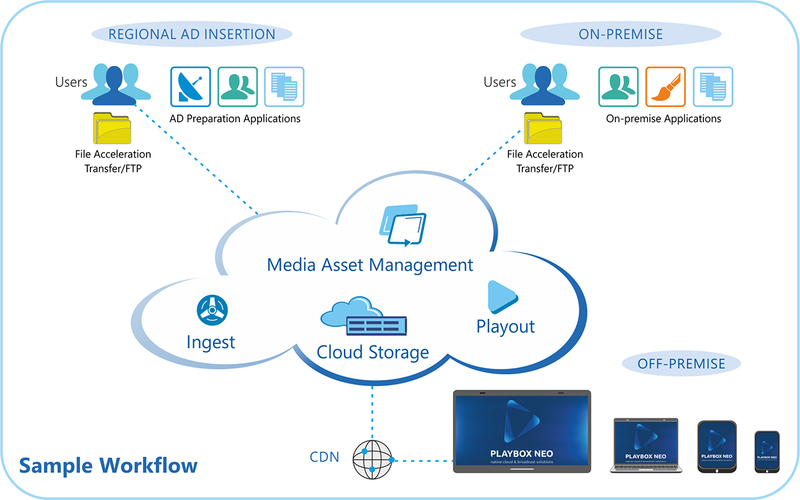 Cloud2TV is based on the concept of virtual channel playout and is totally software-centric. Its processing platform and cloud-native services represent the future of video production and content delivery, providing TV operators with ultimate simplicity, efficiency and agility. Cloud2TV incorporates highly intuitive web-based control interface with administrator-adjustable rights assignment, TV channel management, systems and user action logging and notifications. Cloud2TV applications are the main components. Each functions individually but in close co-ordination with the others to provide a full set of broadcast services supporting the workflow of an entire TV channel. Basic Cloud2TV applications are Content Ingest, Graphic Editor, Media Browser with Meta data handling & Clip trimmer, Quality Control & verification tools, Transcoder, Playlist Manager and Audit Log. Cloud2TV simplifies the entire business of putting a new television channel on air. Available on a budget-friendly SaaS subscription, it offers numerous advantages such as fast and on-demand channel launch, endless scalability, 24/7 reliability, web-based access and IP workflow. The core of every Cloud2TV is the Playout/IP streaming service, supporting UHD, HD and SD playout. Cloud2TV is fully compatible with existing PlayBox Neo solutions and can be used to extend their capabilities and functionality. Cloud2TV can be operated in fully automated mode. It also gives operators the freedom to make schedule alterations or insert live content between prescheduled content whenever a late-breaking story makes this desirable or imperative. PlayBox Neo offers technical support and round the clock customer care. Software updates and 24/7 global support are standard. On-Premises turnkey system for deployment by a broadcaster or service-provider. Accessible on a monthly software-as-a-service basis, it enables service providers to launch new channels for third-party customers. Using Cloud2TV, established broadcasters and new- start entrepreneurs alike can deploy cloud-based playout quickly, easily and affordably.